Today I thought of discussing and reviewing a game for the Xbox 360 platform. The name of the game today which I am going to discuss and review is Dust: An Elysian Tail Review. This game comes under the category of the adventure game and there are a lots of missions and action filled in it. This game is specially made for the Xbox 360 and this is the reason for its good graphics and sound. So let's learn more about this game try to know what is good and bad about this game. Like a movie in which hero takes the responsibility of saving the world, same case is here too in this game. You are playing a character that fights with his sword. The sword he carries is very specialized blade and it can chop many enemies in one strike. The history of the player is not known to us as he forgets to remember, due to the memory loss problem. When he woke up in the world he finds that the monsters are running the place and they are terrorizing and killing the villagers. Like a true hero he woke up and starts fighting and getting down the monsters. The monster will come from everywhere, sky or ground. The storyline of Dust: An Elysian Tail game has quite an depth to it, the narration is excellent and audio matching to the gameplay. So you will perform the task of helping the villagers and killing the monsters. As you will cross one level after another in Dust: An Elysian Tail game the story of the character unfolds in front of you. So you have to listen it if you want to listen it. But the voice of the narrator is very bad and cannot be listened to properly. When first time you pick your sword you will be taught to how handle the word and how to use it properly. When you first time pick the sword you will be taught to fighting or combat positions. But then as you play the game, you will be able to use other combat operations. There are various power which are available in your blade and it is your duty to learn this in order to kill the enemies in one shot. The word which is provided to you in this game is very good and better than any other enemy sword in this game. There are various types of enemies which are present in this game and you will enjoy while playing these levels. So on, a whole a nice game to play with. 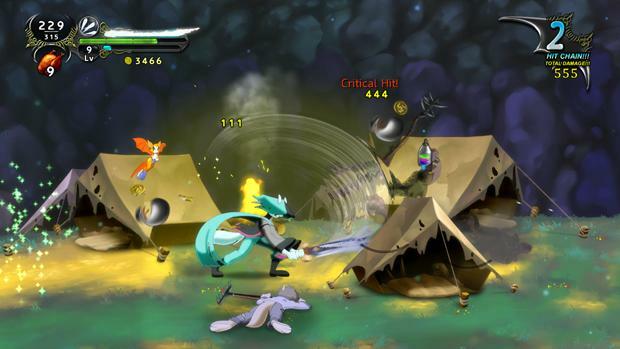 Unlike other RPG games, Dust: An Elysian Tail game has lot of different things. Yes, boss level is little bit weak but the actions and other stuff are very good. They have modified this game and turned in to a fun game. Killing and fighting with enemies is a good part of this game and you will love it to play. The user interface of the game simple to follow and the demarcation on the screen are truly simple. The graphics of the game are good and appears better in good resolution screen.